Model 80 two-door trunk Sedan. 70 horsepower six-cylinder engine. 130-inch wheelbase. Updraft carburetor with vacuum tank. Notice the four wheel brakes; this was a brand new feature in 1925. The pride of presidents and princes, the Pierce Arrow was one of the most envied and respected names in the history of American motoring. 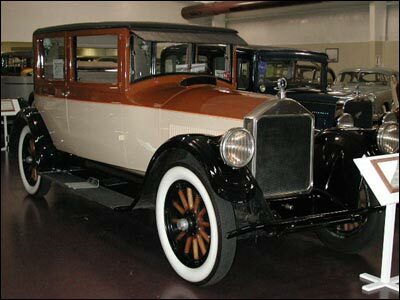 The Pierce Arrow was the car of choice of the rich and famous…and of every president from Woodrow Wilson to Franklin Delano Roosevelt. In the mid 1920’s, however, the Pierce Arrow policy of aiming only at the upper crust market was beginning to lose its potency. In an effort to reverse its sliding sales trend, the company brought out a lower price car, the Model 80 that you see here. This new Model 80 retained Pierce Arrow’s distinctive headlights in the-fenders styling. It also featured a smooth, well engineered six-cylinder engine. The Model 80 for 1925 was a success in the marketplace.